Consider this scenario: A remote warehouse containing valuable material has been severely damaged. You don’t have the resources to guard it full-time. How do you keep people out until you can return with a larger crew to recover the items? Just locking the doors won’t suffice as the structural damage created vulnerability. How do you prevent the merely curious as well as others who are highly motivated by profit or ideology from accessing and looting the facility? How do you dissuade or slow the more nefarious individuals while ensuring you don’t harm those who are simply inquisitive? Southwest Research Institute has been working on access denial techniques for more than 20 years. 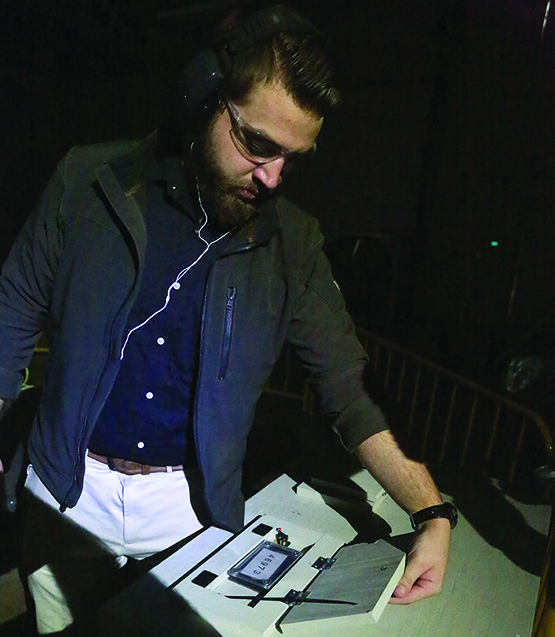 Under a project sponsored by the Defense Threat Reduction Agency, SwRI engineers recently developed and demonstrated a system that can detect an intruder and activate a variety of aversive devices designed to deter people from entering or looting a defined area. Engineers worked with the Edgewood Chemical-Biological Center to conduct the Combined Effects Payload for Access Denial program. CEPAD is one of several threat deterrence and access denial programs that SwRI has conducted. Past programs include the Portal Obstruction Device and the Mobility Denial System, which deposits slippery material to prevent movement. The ongoing Long Range Ocular Interrupter program uses high-powered eye-safe laser light to warn potential adversaries and disrupt hostile actions. From left: Ron Mathis is a senior program manager focused on nonlethal technologies, access denial and target vulnerability assessments. Joe Mitchell is a principal engineer specializing in the development of electro-optical, laser, infrared and remote sensing systems. Research Engineer Mark Tellez supports the design, development and testing of mechanical and electrical systems. The goal of the CEPAD program is to design a system to dissuade or prevent individuals from accessing a protected area using a set of devices that produce aversive effects intended to cause avoidance of the situation. A series of active nodes detect the presence and motion of an intruder. Each node has “effect” devices that produce differing levels of deterrence, ranging from flashing lights to loud noises to pyrotechnic effects and stingball grenades that release rubber pellets when they explode. The system applies an “escalation of force” military strategy. Its nodes communicate with each other and with a central control node to intelligently determine the appropriate effect level at any given time and place. The types of effects produced vary. The system ascertains the direction of motion and increases the intensity of the effects if the intruder does not retreat. Ongoing or repeated attempts to proceed further into the protected area meet increased deterrents, but individuals can retreat unimpeded. SwRI configured a simulated warehouse to test this system. In the initial phase, engineers developed and used robot mannequins to simulate intruders and trigger the motion sensors. In the most recent phase, SwRI conducted tests to assess the relationship between the various effects to determine which combinations of modalities are most effective at dissuading different groups of individuals. To perform this analysis, SwRI worked with the San Antonio-based Air Force Research Laboratory’s Human Effects Center of Excellence (HECOE) to develop a testing protocol using volunteers. These volunteers were “cast” in the roles of various individuals attempting to access a warehouse and conduct tasks associated with looting material. Engineers gathered data about the subject’s performance to populate a behavioral model developed by HECOE. The model is designed to predict the behavioral response of individuals and groups with varying levels of motivation to aversive devices with varying levels of deterrence. DETAIL Nonlethal weapons, also called less-than-lethal or deterrent systems, are less likely to kill a living target than conventional weapons, such as firearms. While unintended or incidental casualties can happen wherever force is applied, nonlethal weapons reduce the risk. 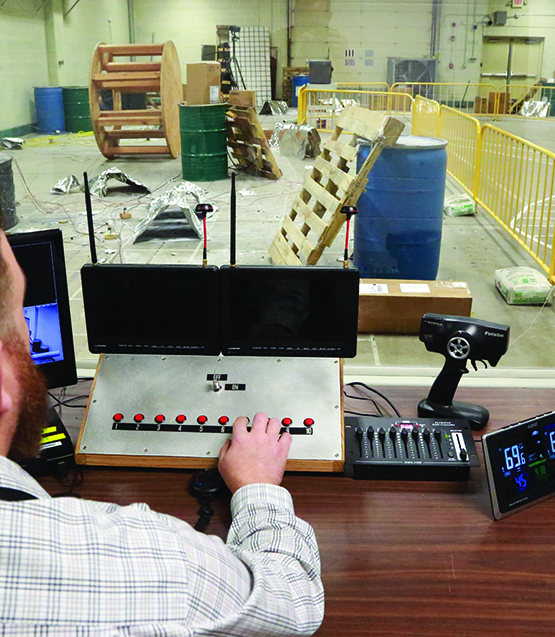 SwRI created a simulated warehouse outfitted with technology to detect the presence of an intruder and activate a variety of aversive effects, designed to deter unauthorized entry. To evaluate fine motor skills and memory, testers asked subjects to memorize a code and then go to a safe and open its pushbutton combination lock. 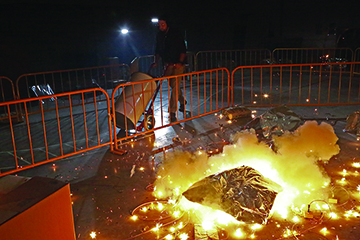 They had to complete this task twice using two different combinations in an aversive environment, including flashing strobes and pyrotechnics. Principal Technician Gregg Williams collects data from the test subjects completing the obstacle course for input into a behavioral model to produce a virtual simulation of how “intruder avatars” will respond to various stimuli. The ultimate goal is to design the most effective deterrent systems to protect assets from both curious and nefarious intruders. An independent Institutional Review Board (IRD) approved the SwRI-developed sequence of test activities as well as the steps taken to minimize potential hazards to the test subjects. SwRI recruited volunteers for the tests from a pool of candidates that met specific profiles. Because the level of deterrence needed will vary depending on the individual, the test protocol assigned and evaluated three levels of motivation for a potential intruder. In this scenario, the first motivational level is that of inquisitive individuals entering places merely to satisfy their curiosity. They seize the opportunity to go inside the warehouse, even though they know they are not allowed. They think, “Look at all these barrels! I wonder what’s in all these things.” They want to take the barrels outside to inspect them, to look for anything interesting. Their goal is to take as many barrels as they can to satisfy their curiosity. The second motivational level is that of profiteers. They make their living stealing high value items, such as cars or surplus military equipment, and selling them to the highest bidder. They know valuable objects are usually protected and that an alarm system may detect their presence. They believe something lucrative must be in the warehouse. When they enter the room, they immediately assume that the barrels contain valuable items. Their goal is to take as many barrels as they can to increase profit. DETAIL An avatar is an icon or a figure representing a particular person in video games, internet forums, or, in this case, a computer model. For CEPAD, various intruder avatars are designed to represent the curiosity seeker, the profiteer and the ideologue. The highest level of motivation belongs to ideologues who are driven by political and/or religious beliefs. These individuals are willing to sacrifice their lives if it means their cabal will thrive for future generations. An authority figure of their organization ordered them to remove these barrels because materials inside could further their cause. Their goal is to take as many barrels as they can to please their circle and to satisfy their personal commitment to the cause. 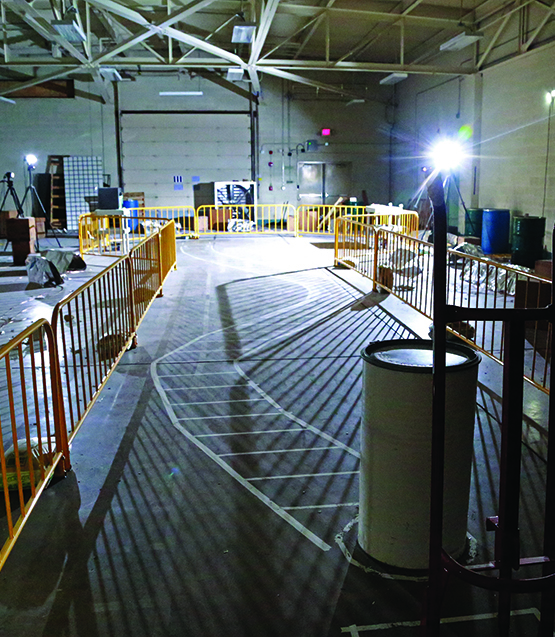 Engineers used a custom-developed obstacle course (above) to evaluate a test subject’s ability to perform tasks in a dark, distracting environment, including strobe lights, pyrotechnics and earphones playing a high-volume soundtrack, including gunfire, screeches and explosives. SwRI evaluated how deterrents affect a test subject’s gross motor skills, in this case using large muscle groups to maneuver a heavy object. Subjects had to load a barrel onto a dolly and deliver it to a specific location, following a curved path without deviating outside the lines while being subject to varying levels of distraction. SwRI engineers configured the course to allow each subject to conduct the tests safely while gathering relevant data. 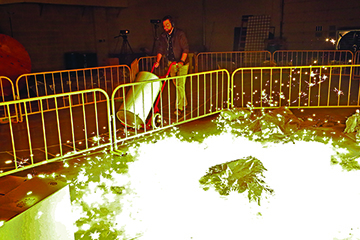 Crowd control barriers surrounded the task performance area, safely separating the test subjects from pyrotechnic devices. 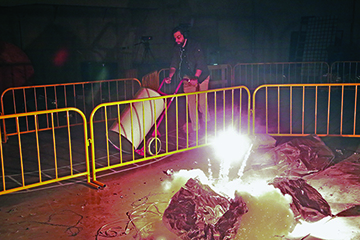 This area was cluttered with debris and objects, simulating a real warehouse environment while concealing the pyrotechnics. Within the test area, the retroreflective tape on the floor outlined the route for the barrel movement. Infrared cameras and illuminators mounted at either end of the track allowed testers to observe whether the dolly stayed within the marked lane and how fast the dolly was moving. They could also time how long it took the subjects to open the safe and assess how many errors were made. Engineers measured the heart rate and blood pressure of the subjects before, during and after the test. The team also evaluated working memory before and after the test, asking the subjects to recite a set of numbers. In addition, test subjects answered a questionnaire related to the three intruder motivation levels. In addition to the testing conducted at SwRI, our CEPAD collaborators have evaluated the effects of other deterrents, such as smoke and malodorants, using a similar protocol. All the test data are being input into HECOE’s behavioral model, known as Simulated Agent Response to Directed Energy Applications and New Technology. This computer model will produce a virtual simulation of how “intruder avatars” will respond to various stimuli. Through this software, it should be possible to predict the types of effects, at what intensities and in what combination will most effectively dissuade each motivation group. The ultimate goal is to design the most effective deterrent systems to protect assets from both the curious as well as those who seek to do harm. SwRI could expand CEPAD human subject testing to include groups acting in unison. SwRI’s prototype testing demonstrated the capability to integrate multiple deterrent devices to central command modules within a protected area. In the future, the command module could be expanded to allow audio-visual data to be sent to a command post to alert a monitor of the intrusion into a secured area, in case a more aggressive response would be required. While the deterrent devices employed in the initial assessment demonstrated the capability to discourage some individuals, SwRI could evaluate more aggressive devices such as stingball grenades, smoke and malodorants. More than 20 years of experience in developing nonlethal systems is now complemented by expertise in designing IRB-approved human test activities, opening up a range of new project possibilities. Visit Electro Optic & Photonic Systems for more information or contact Ron Mathis at (210) 522-3136.